When I got my MIA BOX from @acrylicbeautyboxco about a month ago, I was more than ecstatic with the organization possibilities little did I know I was about to completely overhaul my beauty room. I ended up buying two extra Alex drawers from @ikeausa to put my MIA BOX in since this baby is so big that you will need extra desk space for it. BUT it allowed me to organize things by brand and completely take things off my desk. All my ColourPop is on a different organizer so instead I have this for my @limecrimemakeup and @jeffreestarcosmetics, my @kyliecosmetics and @maccosmetics as well as my @natashadenona favorite palettes and my @viseart and @juviasplace singles palette. I am trying this organization and see if it works for my getting ready needs as well as my blogging needs (it’s easier to find things to compare when I can see the colors. These boxes are going to cost you a pretty penny but thisnhere is HUGE. 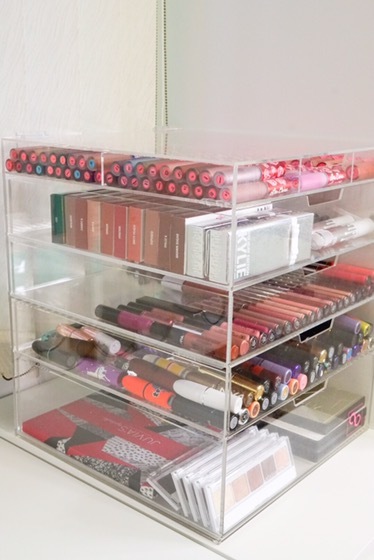 A regular costumer doesn’t have as much hoarding of makeup as I do (blogging. Years of shopping as therapy etc) so you’ll prob be able to house your entire collection here. BEAUTYCULT25 saves you 25% off this beauty (non affil). Minimalistic and spacious enough for palettes and anything in between. I did a little sneak peek of how it’s looking on SNAPCHAT but I’m going to do a full “tour of my MIA BOX” for IG STORY in the afternoon. Right now just came from picking up the ingredients to make COQUITO so you know how my evening will go!!! Check out the other stuffs acrylicbeautyboxco has in store for different organization ideas!